Discussion in 'General Discussion' started by VOXNEWS, Feb 12, 2019. NonFactor, Johhny Mad Dog, Copperfield and 15 others like this. Added 2 skins that the community made so we can make some more money. Both team A and team B made excellent progress which shall be seen in the upcoming expansion in 2026. JEDIMind, NonFactor, Blaze and 8 others like this. JEDIMind, Johhny Mad Dog, ArrowExpert and 6 others like this. 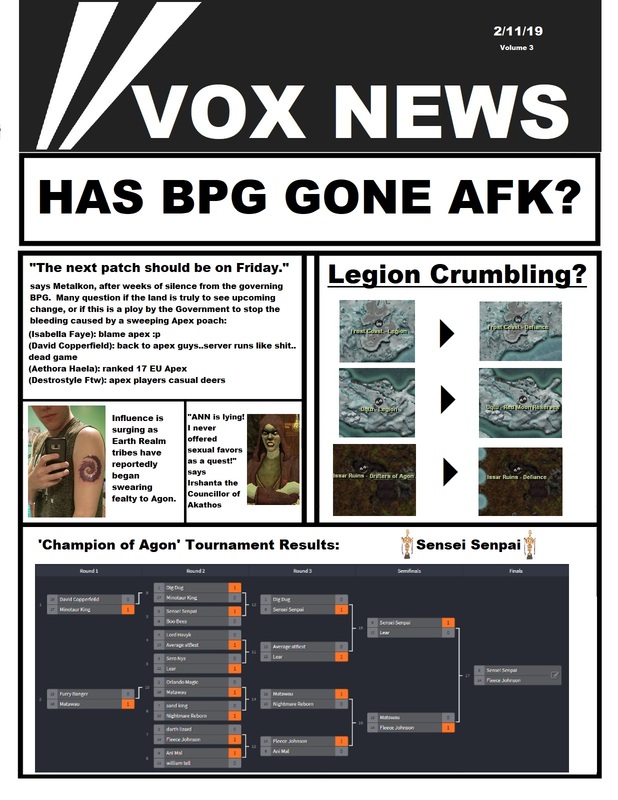 Fake news, legion has never been better. I don't know. I hear Vox has incredible sources. DeadlyHit, Yomi Scythetalon and Korag like this. Congrats Sensai Senpai on winning the tournament. Lucky Arrow didn't show up! Blaze, ArrowExpert, Bonii and 1 other person like this. JEDIMind and NonFactor like this. In the next patch I heard stone node drop rates will be increasing too! Blaze, DeadlyHit, Bonii and 1 other person like this. I hear in maybe 6 more months they might revert combat. Unfortunately they will probably make the server and client run worse in the process. Also new content is on the road map for 2022! Hype! NonFactor, Isaac Clarke, ArrowExpert and 1 other person like this. Scrubby Bear, ArrowExpert and Sero like this. Where'd you find these patch notes? Been searching everywhere for these!? Yomi Scythetalon and Bonii like this. But yet anytime you are sieged you spend ages crying on global, followed by ages crying in pms, followed by ages crying on the forum. That’s the only content anyone gets from a siege, watching your tears providing excellent lubricant to me jacking off over pixels. JEDIMind, AbbaSalama, Yomi Scythetalon and 5 others like this. Isaac Clarke, Yomi Scythetalon and Sero like this.